Portable buildings and modern, luxury sheds make great home offices. Prebuilt portable buildings are an affordable solution when you need extra space to setup a home office. We offer a complete line of portable building solutions in wood and vinyl. Be sure to check out our full line of sheds for a variety of additional portable buildings choices and options. With a custom built portable building or shed, you can select each feature. Some of our most popular portable buildings and sheds are shown below to give you ideas for customizing your hunting cabin or simply order a model exactly as shown. Check out our FAQ page for information about delivery and setup in the Maryland, Virginia, West Virginia and Pennsylvania region. All our portable buildings are delivered fully assembled to your prepared site... or we can build on site. Also available in kits for the do-it-yourselfer. Note: Building styles, availability, and prices are subject to change without notice. The Carriage House/Quaker sheds back wall is shorter than the front wall and has a 15" overhang in front. Picture 1 Quaker 10' x 16' Vinyl Shed shown with optional 11 lite fiberglass doors. Colors are Vinyl white with Blue Trim and Architectural Nickel Gray Shingles. Picture 2 Quaker 8' x 12' Wood Shed shown painted Dark Brown with Clay Trim and Dark Brown Shingles. Available in sizes 6' x 8', 6' x 10', 8' x 8', 8' x 10', 8' x 12', 8' x 14', 8' x 16', 10' x 12', 10' x 14', 10' x 16', 10' x 18', 10' x 20', 10' x 22', 10' x 24', 12' x 12', 12' x 14', 12' x 16', 12' x 18', 12' x 20', 12' x 22', 12' x 24', 12' x 26', 12' x 28', 12' x 30', 12' x 32'. The differance in the Classic Cottage/A-frame Sheds and the regular Cottage/A-Frame Sheds are the Classics have an 8" overhange, larger windows, picture frame around windows and your choice of three different colors on one shed. Comes in Wood or Vinyl siding. Picture 1 10' x 16' Wood Classic Cottage shown with optional transcom windows in doors. Painted Navajo White with Clay Trim, Red Doors and Shutters and Weatherwood Architectural Shingles. Picture 2 10' x 16' Vinyl Classic Cottage shown with Vinyl Clay with White Trim, Green Shutters and Weatherwood Architectural Shingles. Available in sizes 6' x 6', 6' x 8', 6' x 10', 8' x 8', 8' x 10', 8' x 12', 8' x 14', 8' x 16', 10' x 12', 10' x 14', 10' x 16', 10' x 18', 10' x 20', 10' x 22', 10' x 24', 12' x 12', 12' x 14', 12' x 16', 12' x 18', 12' x 20', 12' x 22', 12' x 24', 12' x 26', 12' x 28', 12' x 30', 12' x 32'. Wood and Vinyl siding available. Many color choices and other options available too. This portable building would make a great pool house, home office, club house, hunting cabin, or workshop and is shown with two 18” x 27” windows with shutters, vent in each gable end (not shown) of building, 4’, 5’, or 6’ double door, depending on the size of the building, 3’ walk in door on porch, 3 x 8 porch with railing and composite decking, flower box (not shown), 7’ sidewalls to where the roof starts, porch can be placed on either side of building and double door can be placed any where on building. Picture 1 is shown in size 10' x 16' with tan vinyl siding, white shutters and trim, and optional dual brown Architectural shingles. Picture 2 is shown with tan wood siding, brown shutters and trim. Picture 3 is shown with gray vinyl siding, window boxes, white shutters and trim. Available in sizes 8' x 16', 10' x 16', 10' x 18', 10' x 20', 10' x 22', 10' x 24', 12' x 16', 12' x 18', 12' x 20', 12' x 22', 12' x 24', 12' x 26', 12' x 28', 12' x 30', 12' x 32'. Note: Porch is always 8'. Wood and Vinyl siding available. Many color choices and other options available too. There are 4 different styles of Dormer Sheds, the first one is the A-Frame dormer with a diamond shaped window in the dormer. The second one is two small dormers that sit on the roof of the shed. The third one is the studio dormer that uses the transcom windows. Picture 1 10' x 16' shown is the A-Frame Dormer with Vinyl Clay Siding with White Trim, Black Shutters and Black Architectural Shingles. Picture 2 12' x 16' shown is the 2 Small Dormers on top of the roof with Vinyl Clay siding, White trim, Black Shutters, shown with optional Impression Siding on dormers, Architectural Weatherwood Shingles. Picture 3 10' x 16' shown is the Studio Dormer with the Transcom windows, shown painted all Red with Black Shingles and optional Shingle Return. Picture 4 10' x 16' shown is the Reverse Double A-Frame Dormer shown in Vinyl Flint Gray siding with Black Shuters and Nickel Gray Shingles Architectural Shingles. Available in sizes 8' x 10', 8' x 12', 8' x 14', 8' x 16', 10' x 10', 10' x 12', 10' x 14', 10' x 16', 10' x 18', 10' x 20', 10' x 22', 10' x 24', 12' x 12', 12' x 14', 12' x 16', 12' x 18', 12' x 20', 12' x 22', 12' x 24', 12' x 26', 12' x 28', 12' x 30', 12' x 32'. Wood and Vinyl siding available. Many color choices and other options available too. Also great as a pool house, office, or hunting cabin. Shown in 12' x 16' Victorian, cream vinyl siding, weatherwood shingles with three 18� x 27� windows, vinyl shutters, vinyl railing, 11 lite steel door, 4� porch with composite decking, optional Architectural shingles and optional ridge vent. Available in sizes 8' x 10', 8' x 12', 8' x 14', 8' x 16', 10' x 12', 10' x 14', 10' x 16', 10' x 18', 10' x 20', 10' x 22', 10' x 24', 12' x 12', 12' x 14', 12' x 16', 12' x 18', 12' x 20', 12' x 22', 12' x 24', 12' x 26', 12' x 28', 12' x 30', 12' x 32'. Vinyl and Wood siding available. Many color choices and other options available too. We can customize any of our portable buildings by adding extra windows just where you need them most, eliminating windows you don't want, moving the door to a different side of the shed to accomodate your specific needs, or adding accents like a front porch, or loft to be used as a sleeping area or for storage. We would be happy to any questions you may have and help you design the perfect hunting cabin. You have a choice of paint, vinyl siding and shingle color from our options. 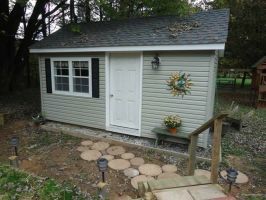 Any shed or portable building can be custom tailored to be used as stand alone home office on your property. With a custom designed portable building, you can select each feature. Because these buildings are portable, they make great home offices outside your home. Some of our most popular home office portable building styles are shown below to give you ideas for customizing your own or simply order a model exactly as shown. Optional pressure treated floor and joist available. Slider windows and vinyl trim and shutters. We also have a new style door on the wood buildings instead of the "X" pattern. Just add electric, insulation, heat, air conditioning or fans to complete your office.